Win10 Wizard is a free tool that helps Windows users upgrade to, then tweak and manage their Windows 10 system. I don’t think there’s another app around quite like this one. It can scan your computer to make sure you’re ready to upgrade and report any problems and warn you about things like losing Media Player, etc. You can see that in screenshot 1 below. From there you are forwarded to the Microsoft Site where you can find the instructions and download for Windows 10. Win10 Wizard is also is there after your Windows 10 upgrade with a lot of tweaks and settings. Win10 Wizard is aimed at both Windows 10 users and those who have not yet upgraded their systems. The first category can use it to tweak the system settings, prevent data collection (the controversial function of Windows 10) and change the appearance of their PC, whereas the latter category can benefit from a guided upgrade to the latest OS iteration. With all the built-in telemetry and behavior monitoring functions Windows 10 brought, it’s no wonder that privacy-oriented users are looking for ways to tweak the security settings before upgrading from older OS versions. Win10 Wizard comes with such options, allowing users to disable functions that might jeopardize their privacy. Each function is accompanied by a brief explanation, so one should be aware of the changes in the system configuration. Win10 Wizard can deactivate Inventory Collector, Advertising ID, app notifications, biometrical features, or Cortana reset. Other options allow them to disable app access to the camera, the calendar or the microphone, block feedback reminders and OneDrive. Win10 Wizard can also tamper with the location settings, preventing the system and installed apps to access it. Additionally, it comes with options for disabling telemetry settings, the WiFi Sense option, the User Steps Recorder, peer-to-peer updates, and app access to wireless connections. In other words, it enables users to tweak the security settings to match their preferences. Alongside security-related tweaks, Win10 Wizard can perform disk cleanup and detect compatibility issues of drivers, apps, and extensions. 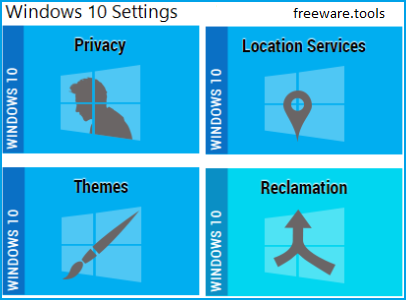 Furthermore, there are a few options that enable Windows 10 users to change their PC’s look. They can enable the dark theme, disable the default digital clock and calendar, disable the Start Menu (or make it transparent), remove the battery indicator, and more. Although even more privacy settings could be further included (for instance, hosts blocking), Win10 Wizard provides a quick and simple means for you to customize the system’s privacy settings.